Perennial herb from a slender, brittle rhizome; stems erect, glabrous, juicy, flowering stems leafless, 15-45 cm tall. Basal leaves 3-4 times divided, the ultimate segments linear to oblong, abruptly pointed. Inflorescence of 5-15 flowers in a drooping panicle; corollas pinkish-purple, heart-shaped at the base; outer petals with a pouched spur 2-4 mm long, tips 3-4 mm long and spreading; inner petals 10-15 mm long. Pod-like capsules, 2-3.5 cm long, 3-4 mm wide; seeds 2 mm long with a white oil-rich appendage, black, shiny. Moist woodlands, forests and streambanks in the lowland and montane zones; common in SW BC, infrequent eastward in S BC; S to CA. A shade-tolerant/intolerant, submontane to montane, Western North American forb distributed more in the Pacific than the Cordilleran region. Occurs in maritime to submaritime cool mesothermal climates on fresh to very moist, nitrogen-rich soils; its occurrence decreases with increasing elevation and continentality. Sporadic to plentiful in the herbaceous understory of young-seral forests on water-receiving sites; most common in broad­leaved forests. Occasional in early-seral com­munities on disturbed sites (burns and clearings). 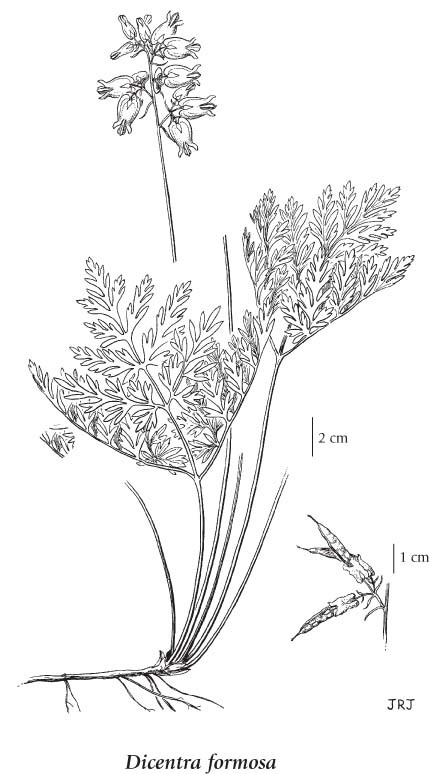 A nitrophytic species characteristic of Moder and Mull humus forms.